Over the summer, synchronized swimmers Katie Gu, grade 12, Kate Chow, grade 8, and Anna Piskun, also grade 8, who are all members of the Santa Clara Aquamaids synchronized swimming club, traveled to a number of competitions. Gu finished fourth at the 2013-14 Senior National Team Trials in Riverside, Calif., and later traveled to Puerto Rico with the rest of the U.S. Junior National Team to the Unión Americana de Natación (Amateur Swimming Union of the Americas) Pan-American Games. There, the team won first place. At the U.S. Age Group Synchronized Swimming Championships in Riverside, Piskun’s team placed second overall in the 13-15 age group. Piskun also placed third in combination routine at the U.S. Open Synchro Swimming Championships in Irving, Texas. Chow also competed at the Pan-American Games as a member of the 2013-14 national team in the 11-12 age group, and her team ended up placing first. At the U.S. Age Group Championships in Riverside, Chow’s team won first place. Her duet performance won third place, as did her trio. 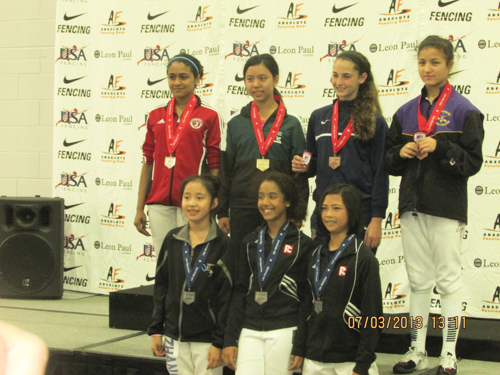 Foilist Jerrica Liao, grade 8, is the Youth-12 U.S. champion! She took the gold medal at the U.S. Fencing Summer National Championships in Columbus, Ohio, this July. Liao has finished in the top 16 in the past, but this year, her last in the Y-12 bracket, she earned the ultimate triumph. Liao lost only one bout in her pool of seven but, out of 158 fencers, that was enough to seed her only 20th. Then the real fights began. Y-12 fencers fence for the best of two out of three five-touch bouts, and Liao, after a bye in the first round, beat her first three opponents in two bouts each. In the round of eight, things got tougher, as she faced the number three seed, winning in three bouts , 5-0, 0-1 and 1-0 (bouts with scores under five points went to time—3 minutes), in what must have been exhausting bouts after an already long day on the piste. Liao then fenced the number four Y-12 female fencer in the country, who was seeded fifth, crushing her in two bouts 5-3, 5-0, but beating her next opponent to reach the gold medal match was tougher. Liao held her course, however, winning in three bouts 2-5, 5-4, 4-3. The gold medal match was a bit of an anticlimax, with Liao cruising to the championship 5-1, 5-1. Liao’s finish left her ranked second in the U.S. in Y-12. Though she has now aged out of the Y-12 bracket, she has already made inroads in the Y-14 competitions. In Columbus, she fenced in the Y-14 bracket, where she took 22nd out of 152 fencers and is now ranked 11th in the U.S. in the Y-14 bracket. Liao trains at and fences for California Fencing Academy in San Jose. Congrats! Grade 5 basketball enthusiast Benjamin Soraire and his National Junior Basketball League team, the Saratoga Fire, won the full court tournament on Aug. 25, defeating the South Bay Warriors. The Fire struggled early in the season, but rallied to make an impressive appearance in the playoffs, which culminated in last month’s tournament win.